For the observation of 'Brownian Motion' in smoke particles. 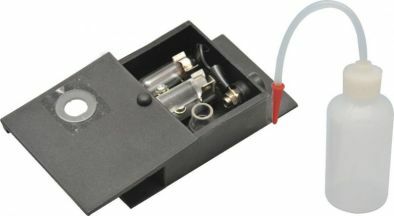 Consisting of a box with plastic lid as well as flanges that allow easy attachment to standard microscopes. The box contains a smoke cell, cylindrical condensing lens and a 12V, 3W festoon bulb. The apparatus has been preset to focus the light at correct height. The set is supplied complete with detailed instructions and a squeeze-bottle type smoke generator. Dimensions: 90 x 46 x 25mm.